To expand my previous definition, an agent provocateur is created when an undercover agent has moved from a passive involvement in crime to an active involvement. This means that such an individual might (and as often is the case) not be a police officer. The individual could be any number of things, from a police officer working undercover, to an informant who is paid or blackmailed, to a member of The Canadian Security Intelligence Agency (CSIS) — which is not a policing agency, and is not in fact required to enforce Canadian law. When we speak of agents provocateur (AP), it is important to note that AP’s are not a new phenomenon in Canadian legal history. Although, generally, the newer cases of Montebello and Toronto G20 come to mind. Historically, we also have the case of Grant Bristow, a former CSIS agent who worked with the Canadian chapter of the Aryan Nations. Unfortunately, the only comprehensive resource on Grant Bristow comes from Wikipedia. Although we do have fellow blogger, Ezra Levant‘s commentary on the matter, as well as Bristow’s interview with The Walrus to draw on. Less user-friendly is a SIRC report written in 1994 investigating CSIS and Bristow’s role in the Heritage Front Affair. Interesting to note is that as I write, this website seems to be no longer available. I will have to look into it. Irregardless, in this case the Wiki article seems to be quite succinct on the subject of Grant Bristow according to my subsequent research. Grant Bristow was an informant employed by CSIS who worked closely with the eventual leader of the Canadian Aryan Nations front, Wolfgang Droege in the ’80s. He has spoken to the fact that his ties with Droege allowed him to prevent various horrific acts of violence, including bombings and riots. However, further investigation has revealed that his placement as Droege’s right hand man may have been what allowed the organization to continue its operations when Droege assumed leadership. The purpose of Bristow’s infiltration was to identify the financial supporters of the Canadian Chapter of Aryan Nations. However, it was upon the impending arrest of Droege (on unrelated charges of assault) and Bristow’s subsequent departure of Aryan Nations in March 1994, that the Front disbanded. Bristow was forced to step down, because if he had not, he would have become the de facto leader of the chapter. In 1994, Toronto Sun reporter Bill Dunphy released an expose on Operation Governor, sadly this news article is not available on the newspaper’s website. Without a copy, what can be said about it is this: the article negatively exposed CSIS’s role in the Heritage Front/Operation Governor Affair and ousted Grant Bristow as the agent in question. In September 2004, Bristow sat down with the Walrus and narrated his own perspective of the operation. The Montebello Incident involved the Surete du Quebec using three undercover officers to infiltrate the anti-Security and Prosperity Partnership (SPP) of North America protests. The SPP was an open dialogue between Canada, America, and Mexico with the purpose of enhancing trade, sharing intelligence, cooperation, environmental protection, and economic stability between the three nations. The SPP was meant to exist along side institutions such as the North American Free Trade Agreement. The SPP was canceled in August 2009. In the above video, peaceful demonstrators are protesting the SPP at the North American leaders summit in Montebello, Quebec. The above video shows Dave Coles (president of the Communications, Energy and Paperworkers Union) ordering three masked men, who were later revealed as undercover SdQ officers, to leave. In August 2007, the SdQ admitted to its involvement. If we take Grant Bristow’s work with Aryan Nations as a true example of an agent provocateur (it, of course has not been labeled as such by law – which brings about issues of accountability to be discussed below) and the police involvement of the Montebello incident, we have two examples of the use of Agent Provocateurs. Gary T. Marx asks us to explore the origins and motives of informants, what they do in radical groups, and factors that enable their transformation into agents provocateur (n.d.). This leads us first to look at Bristow and the SdQ undercover officers as informants, identify some of the motives and concerns that might have lead them to become agents provocateurs. Bristow’s case is interesting because, as an informant working for CSIS, he is in a different position than the undercover SdQ officers. Bristow had no overarching mandate to uphold the law. And he was tasked with uncovering the financial supporters of Aryan Nations. In his quest to do so he developed a strong relationship with Wolfgang Droege. Maintaining that relationship required him to act the part of a supporter of the white supremacist cause. This was an “ends justifies the means” situation. Or we could call it a type of Nobel Cause or Dirty Harry corruption. Maurice Punch describes these types of corruption as specific types of police deviance, however in this case we can apply them to Bristow. Bristow did not believe in the cause of white supremacy, yet he assumed the guise of such in his undercover role. The SdQ undercover officer’s roles in the Montebello incident are most definitely Nobel Cause or Dirty Harry corruption. However, as SdQ is a police agency, with a legal mandate to uphold Canada’s law, we have the further issue of Accountability. Attempting to provoke or incite violence for whatever purpose is illegal. In some cases it could be considered entrapment. (Robichaud’s Criminal Defense Legislation blog offers a clearly defined explanation of entrapment if you are so interested.) The SdQ’s actions at Montebello neatly fall into the definitions of entrapment, although in this case the protesters resisted incitement. Although no violence occurred, why were the police not held accountable for their actions? From the Canadian perspective we have the following: police are required to actively seek out and maintain a network of informants without much leverage. Typically, informants are gathered through actions such as bribes, blackmail, and “flipping.” “Flipping” is where a criminal is given the opportunity to “work off” his crimes through aiding in police investigations. Blackmail is the threat of legal action before an informant is charged. This could include issues of immigration. However, in Canada, police have no real control over the reciprocity process. In order to prevent the abuse of power on part of the police, outside agencies have control over the reciprocity process. This creates a unique situation where the informant could gain leverage over his handler, and make demands in return for cooperation. This also puts the handler in jeopardy during the bargaining process, because he cannot be certain that any promises he makes to an informant will be carried through. As the informant gains more power in his relationship with his handler, it is often the case that he works outside his orders and without confirmation or approval. An example provided by Turcotte involves an informant, while wearing a wire, attempting to entrap a contact in a drug deal. This was outside the scope of the informant’s directions, and completely illegal — any evidence he might have gathered would have been inadmissible in court. As a civilian agent, he was not aware that his actions constituted entrapment. Fortunately, the contact did not accept the deal; if he had, the ramifications are impossible to predict. Although it could be said with certainty that the Police would not have come out of it with high public opinion. Mother Jones also brings up the issue of wires and undercover operations, in the context of terrorist sting operations. The concern raised here is that, while technology advances further and has allowed for virtually undetectable recording devices, there are still many incidents of key interactions not being recorded. The law enforcement side of the debate offers the excuse of “technical difficulties,” while the pragmatic approach is simply one of convenience. Certain conversations are not recorded because it is “inconvenient” for the agency that they be on record. In the study of agents provocateur and their roles in undercover operations, the issue of accountability continues to raise its head. There is a certain “legal gray area” that clouds the use of informants and the use of police undercover agents. We can identify some of the motives of AP’s, chiefly the types of corruption Maurice Punch labels as Noble Cause, or Dirty Harry corruption. We cannot, however identify the solution to APs, because there is so little investigation into the use of APs, and there is no transparent accountability structure in place. CSIS informants hide behind the veil of “National Security.” Police provocateurs have not been legally identified in contemporary cases involving clear incitement. Marx, G. (n.d.). “Thoughts on a Neglected Category of Social Movement Participant: The Agent Provocateur and the Informant,” American Journal of Sociology 80(2): 402-442. Turcotte, M. (2008). Shifts in police-informant negotiations. Global Crime, 9(4), 291-305. doi: 10.1080/17440570802543508. And all the electronic resources cited here-above. A Police Agent Provocateur is a particular type of undercover police infiltrator. However, this undercover agent does not necessarily have to be a Police officer; the agent could be any public civilian who is hired by the Police Department for a special assignment, depending on the circumstances. The role of a police agent provocateur is to basically provoke a group or crowd of people into committing crimes against the state. Provocateurs’ main job is to essentially entice and entrap a large group of people who may be easily influenced into committing harsh and irrational acts of violence, which are subsequently responded to by the state. 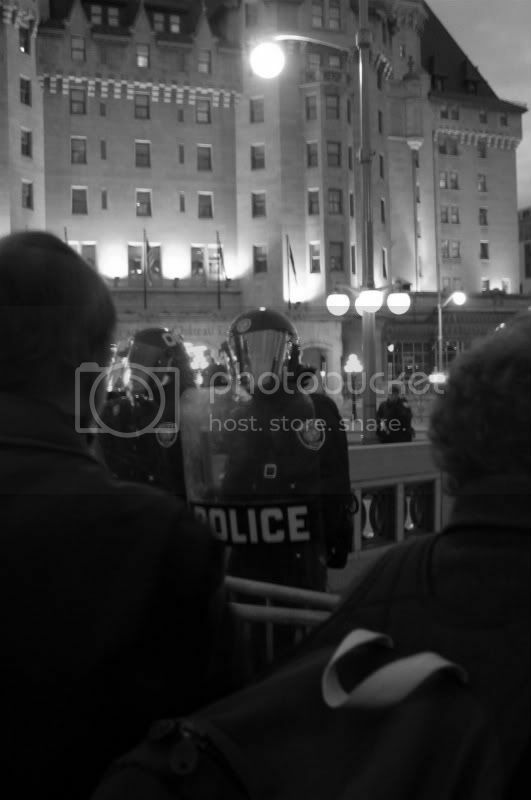 In Canada, there have been several big accusations made against Police agent provocateurs, especially in massive protest which occurred in Canada’s largest Metropolitan area. In Montebello, Quebec, the Sûreté du Québec, which is the Provincial police force of Quebec was accused of using police agent provocateurs in a wrongful manner. Many people gathered to protest meetings of the Security and Prosperity Partnership of North America on August 20 2007. The protest was intended to be a peaceful one, however three individuals who had their faces covered, and wore similar boots to those of the police officers dressed in riot gear, were essentially asked to leave the protest; due to them trying to turn the protest violent. The G20 Summit riots on June 26 2010 occurred in Canada’s largest metropolitan area Toronto, Ontario. Many conspiracies have begun to arise of the Toronto Police Department using officers as provocateurs, in order to provoke the protesters to become violent. Similar to the Montebello incident, many rioters were seen wearing similar boots as Toronto Police officers that day. Rioters wearing similar shoes as officers were caught on pictures destroying local stores, and even going as far as to jumping on top of police cars. Police agents who provoke peaceful crowds into to turning violent should be held accountable for their actions. Officers who participate in the activities of property damage should be held responsible, similar to the members of the public who may be charged with an offence. The police are there to keep peace within and control any situations from arising. However, the more undercover officers provoke a crowd it is not only a danger towards the general public, but also it can cause a huge amount of property damage and put many officers lives at risk; with such a violent crowd. The police make the public look like a bunch of anarchists. However, many undercover officers influence acts of anarchy to be pursued by certain individuals. After searching for “Police Agent Provocateurs” on Google, many different kinds of websites appeared on the first page of results there were about 5,560,000 hits. Surprisingly, the Wikipedia page does contain of a decent amount of Canadian content, compared to other countries. Also, the Wikipedia page introduces the incident which took place in Montebello, Quebec. Furthermore, several multimedia websites such as You Tube appeared with videos of undercover officers provoking rioters, and escalating the violence. Several newspaper articles appeared, such as The Star. In addition, some newspapers from the United Kingdom appeared such as: The Guardian which discussed the G20 protests in London also resulted in a similar situation as Toronto, and The Independent. A non-profit organization known as the Center for Research on Globalization (CRG) based out of Quebec, displayed several pictures of rioters and police officers wearing the exact same boots. The Articles are fairly recent dating back to 2007.